Want on-budget, easy, but delicious recipes? 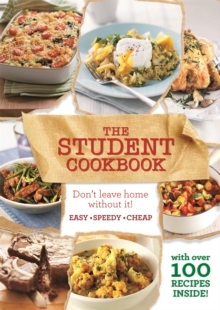 Need to know how to cook after flying the nest to University? Find all the kitchen tip, hints and dishes (and more!) in this super student cookbook. With thousands of young adults leaving home every year, the need to learn how to cook both economically and using limited equipment is essential! Whether it's recreating the perfect roast, whipping up a spag bol or omelette, baking a salmon or just making sure no-one gets food poisoning, the specially created recipes provide all the help required.The perfect size to slide into the suitcase as you wave goodbye.